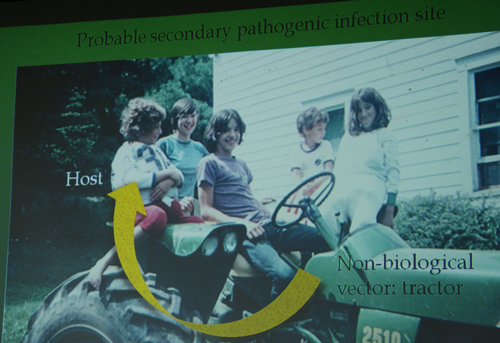 Day 2 of the Conference had so many good things going on. 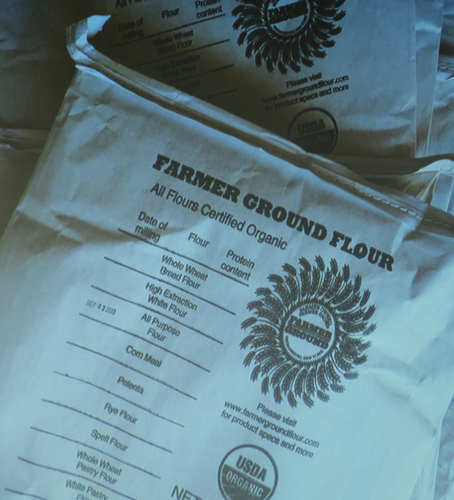 Thor talked about the journey he has taken to become a full-time farmer in upstate New York, and the business model he has developed, adding value to the grain he grows by milling it and baking it. Farming on its own Thor thought a backwards business model: buying inputs at retail and selling at wholesale. 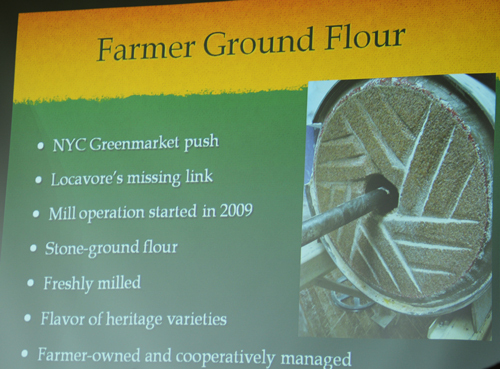 and Wide Awake Bakery, to provide a finished product that is truly local - a testament to New York wheat. And what an incredible testament his loaves are! Well, this was fun! and a great (and rare) opportunity to slap flatbread dough into a tandoor oven! 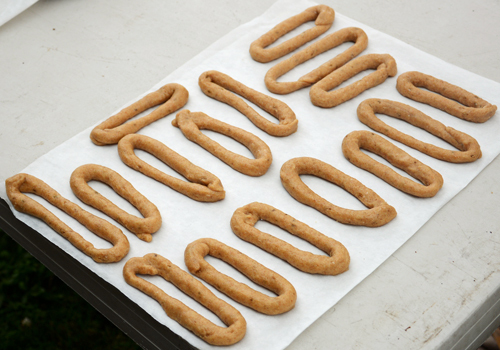 Naomi explained how naan was the name for bread in central Asia, where Tandoor cooking originated; and that Tandoor cooking was originally in clay-lined earth, the earth being the obvious place to hold heat. 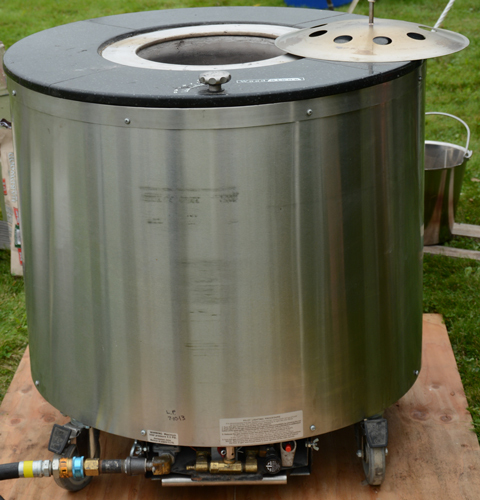 We had the chance to try two different Tandoor ovens, a big fuel-fired one kindly brought to the Conference by WoodStone Corporation – and a second, smaller homemade version, heated with briquettes (it looked like it was made out of a metal can, lined with concrete then clay). 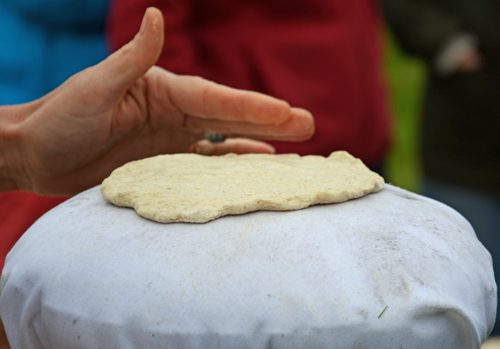 Naomi and Dawn had made two delicious flatbread doughs for us to work with: Snowshoe (Afghan) Naan, made with 75% Oregon Red Fife, levain and yogurt, and another, sweeter one called Nadzuki or Honey Flatbread, flavored with buckwheat and cardamom. 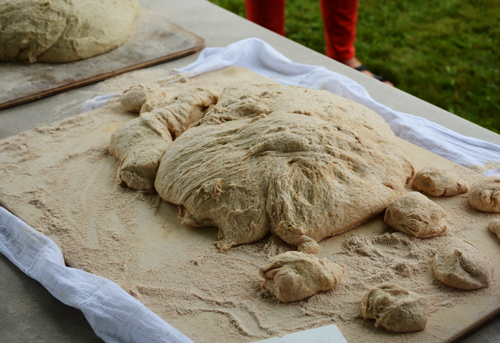 When shaping, Naomi told us to make sure the dough was thin, flat and even, and demonstrated how to do that by grasping the dough along its edges, letting it hang down, then moving around the edges of the dough, gravity gently stretch the dough into a thin round. The dough was docked using beautiful, Turkish docking tools Naomi brought (the tool was floured first to prevent sticking). I wish I’d asked how to spell the name of this tool, but it was pronounced “checkitch”. The wet side of the dough is slapped against the side of the oven (you slap towards you and never reach across the hot oven), where it sticks; as it cooks, moisture transfers into the clay and the bread starts to release when it is done. 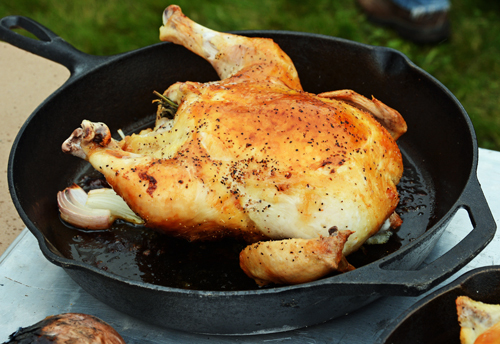 The naandle was used to place the dough in the big Tandoor oven, and oven mitts were used for the small one. 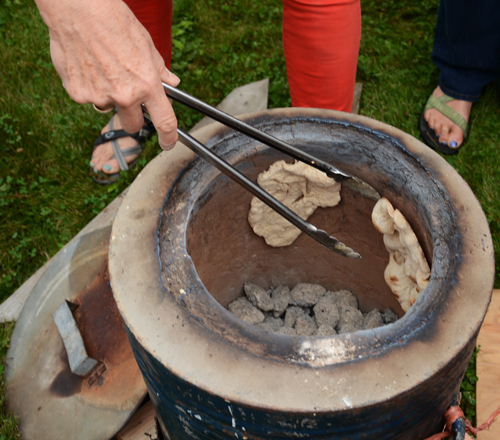 When the bread looked ready, we used a pry bar to release the naan and a hook, or tongs, to remove it from the oven. 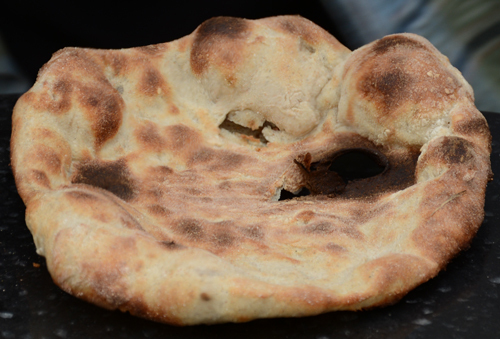 Mmmm, fresh, warm naan bread…! 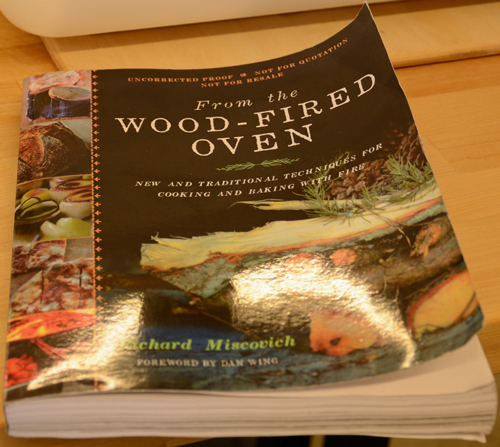 It was wonderful to see Richard Miscovich and get a sneak preview of his new book, From the Wood-Fired Oven. 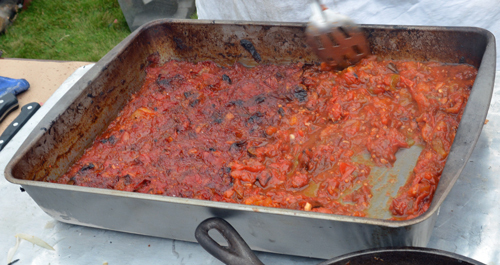 There were so many delicious ways to take advantage of all that heat! 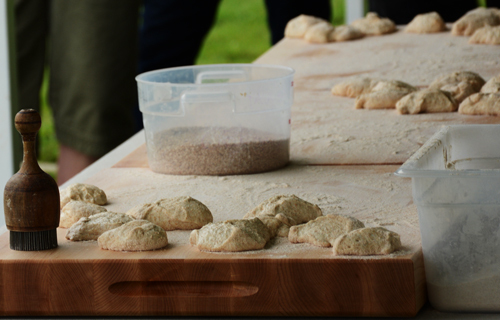 This seminar offered the chance for taste-testing breads and crackers made with single-varietal wheats, to distinguish flavor characteristics of each wheat, and to see if the flavor of the cracker translated into, or predicted, the flavor of the bread. 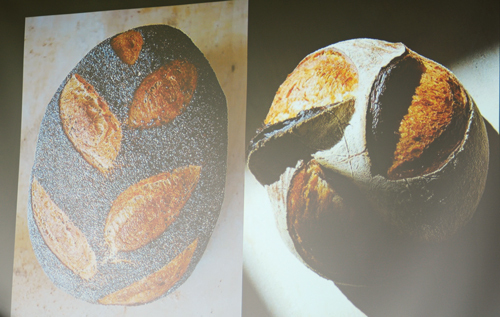 The breads were made with white sour, 2.2% salt and different hydrations for similar dough consistency. It was interesting how different people picked out different flavors for each loaf. 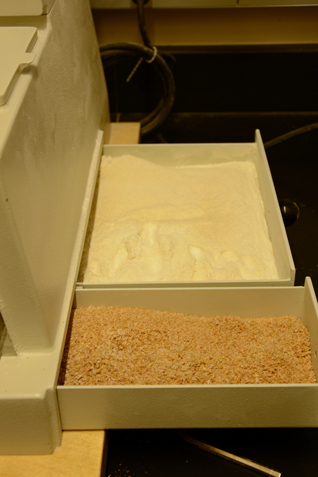 All of the grains (save one) were grown at WSU Mount Vernon (one came from Ontario), and all flour was milled fresh and used within one day of milling. 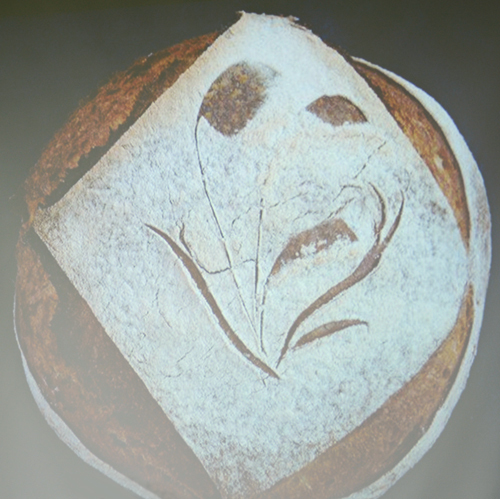 Dr. Jones said this happens with freshly-milled flour. Flavors identified in these loaves by our group of tasters were a range: butteriness, caramel, sweet, pepper, spice, chocolate, bitter, earthy, milky – some loaves had more acidity than others. The bread I tasted made with the Renan wheat didn’t have an upfront acidity but acidity came through and lingered in the aftertaste - quite good. The crackers to my taste had different flavors than the bread, for example, cereal flavors and lemon notes. 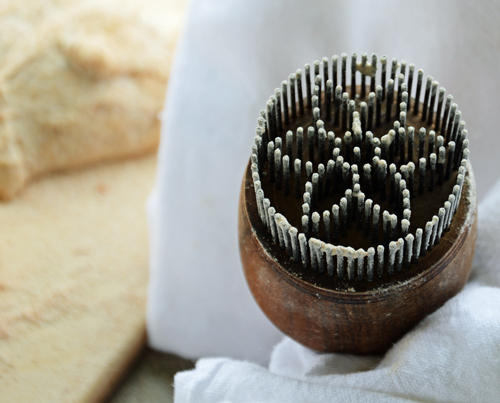 The cracker made from Soissons wheat had a ginger/spice flavor – quite extraordinary! 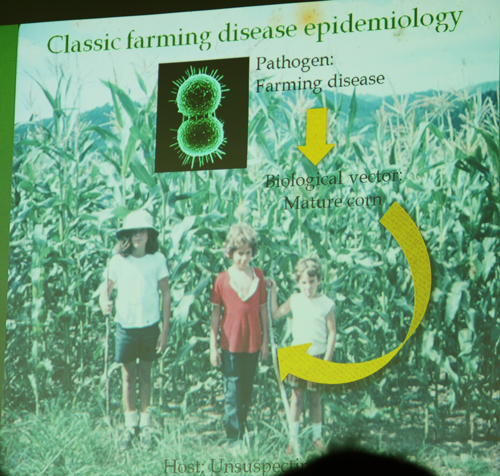 The next day, Dr. Jones talked about the wheat breeding work conducted at his research facility – the large number of wheat varieties they look at each year, breeding for flavor, explaining, or pulling out flavors in wheat by variety, location and year, for chefs and bakers. It would be wonderful to buy single-varietal wheat, labelled to describe flavor notes and terroir – just like you might find for a bottle of wine. It was very interesting and exciting to take part in the taste test and hear more about the work Dr. Jones and his team are doing at WSU! Have you ever wanted to see what the inside of a roller mill looks like? 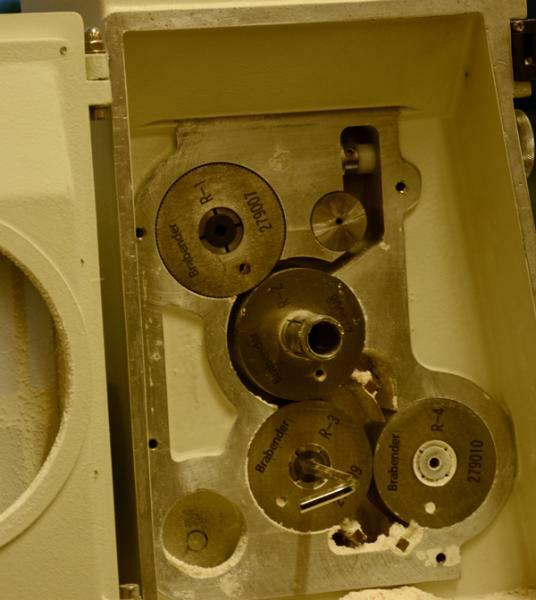 I have, and was grateful Dr. Jones opened up a roller mill to show us the inside, and the end result of milling. Never seen a roller mill cross section! i had only imagined its operation until now. Those Tandoor oven are all over Dubai. Pakistani/afghani mini bakeries dock there breads too, and the scent of Naan can be caught from across the road. 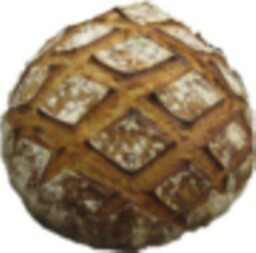 Everything looks spectacular , breadsong! 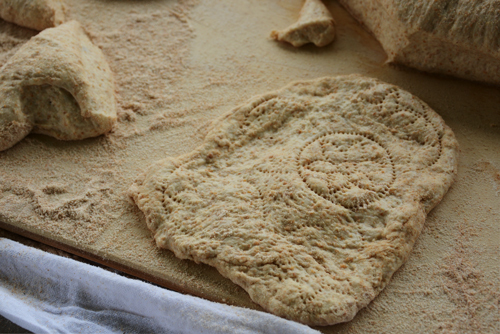 "the warm, welcoming smell of the tandoor..."
Naomi Duguid writes about Afghan Snowshoe Naan in her book Flatbreads and Flavors. 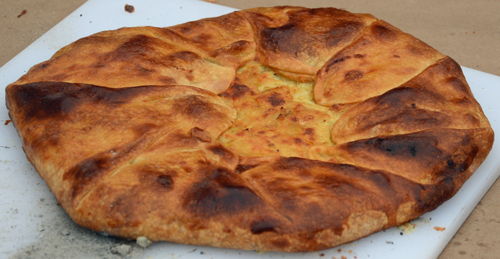 The book describes "the warm, welcoming smell of the tandoor - and of the juniper coals inside" and how the smell of hot bread (in the crisp, dry air) travels well, beckoning people with the aroma. 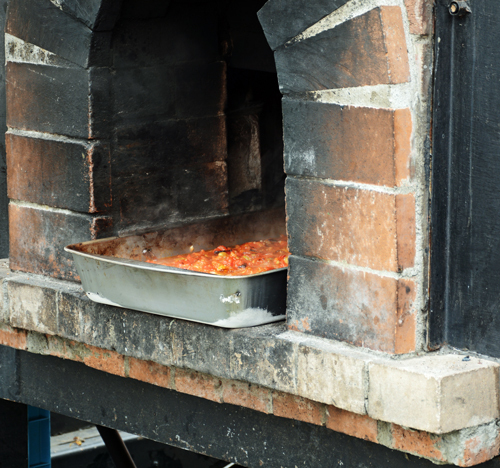 The aroma of these breads cooking was wonderful, and the tandoor ovens were a real draw, with lots of people coming to see, bake and taste. 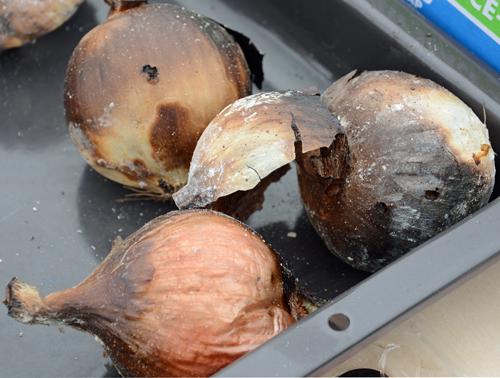 Tandoor baking was a really terrific thing to be able to experience.